I could also rebuild them there crossovers too. Looking for some work i say. They certainly should have plenty of bass. You say you replaced the woofers; i assume you had great bass after that, at least for a while, right? There were a few Plats made with dual inputs, for easy bi-amping. I trust yours is not that type, or if it is it has the jumpers properly in place. Beyond that, aside from the big bass control (which you tried bypassing to no avail) there are just two parts in the crossover that have anything to do with the woofers. They are C1 and L1. If C1 is dying (and at this age it due to be) it will probably look just fine, but inside it could well be garbage. It's the biggest cap in there - you can't miss it. If you disconnect one side of it (clip either lead) and the four woofers take off and pour out bass, that's your problem. It's hard to imagine it could be anything else this side of freaky. Of course, without C1 in the circuit the woofers will also pour forth higher frequencies that you don't want them to reproduce. That's why it's in there - to eliminate highs from the woofers. But if through old age it goes way off value or simply turns into more of a resistor than a capacitor, then things go straight to hell with the bass. What kind of cross overs are used in these? I'm used to seeing the choke in series with the woofer, these must be more complex design. Retriever, I fear you have read my earlier, screwed up post, where I had the cap and coil backwards, like a high pass filter instead of a low pass, which of course is what this is. Anyway, thanks to Mike we now have a Mark IV version schematic, and it's a little different, with two coils, on either side of the cap (actually it shows two caps, but the parallel pair can be considered as one, of course). So two x 175, making 350 mf at 150 volts, NON-POLAR. Lots easier to find these smaller caps, but still not going to find at Radio Shaft. Bob spent a lot of time on these crossovers (which are also frequency shaping, of course), to get the response really perfect. But the bass part is very simple. Note the 8 ohm, 100 watt variable resistor between the woofers and ground it's a real moose of a pot. That and paired caps and the two coils are the whole works, as far as the woofers go. Talmadge, this Mk IV version is probably what you have, so again I have to correct myself a bit. Two big caps, working together, instead of one huge one. Those are what needs testing. And two coils in series with the + input wire. That's all there is to it. I'm not going to make it to Charlotte...we're going to be in the Greenesboro/Raley area for the rest of the week. Hit JacksonvilleMonday, then on to Fayettville Monday aafternoon. Leaving Fayettville today around noon. no problem. I'm probably going to have the crossovers rebuilt. talmadge3 wrote: no problem. I'm probably going to have the crossovers rebuilt. Talk with Tom at VHoP. He's already rebuilt several Carver crossovers, modded some too. They sound great modded. and Advent, Infinity, and a bunch more. The Sunfire ribbons are excellent speakers but they don't have any where near the total output as the amazings. Also they're VERY subwoofer dependent and I personally don't think the Sunfire subs are a good match, I run the Klipsch RSW-10's with mine and they blend together seamlessly and sound like one big speaker, not a small speaker with a sub. That's that problem octave from 100 to 200 Hz. Above the design limits of the sub, and seriously straining the low limits of the CRM-2s. If I were to use two amps and an active or electronic crossover would I simply cross them over at 100hz ? 24db filter? 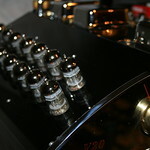 talmadge3 wrote: If I were to use two amps and an active or electronic crossover would I simply cross them over at 100hz ? 24db filter? Now I also have a clearwater electronic xover that was made specifically for the plats and biamp. I would highly recommend closer to 150, for higher power applications, but for say a hundred or so watts, no problem . Elsewhere there are a explanation of the passive x-over lay out and what to expect if you use a two way and eq for the purpose of the notch filters used. Did he ever do the 9 volt battery test to see if all 4 woofers are still connected?